In Depth Events is an event production company. We first began experimenting with LED technology in 2007. 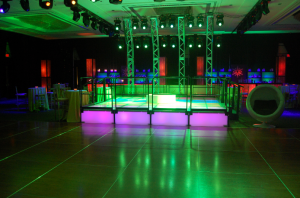 We rented our first LED Dance Floors for an event in Salt Lake City in 2008. Since then, it’s been a wild ride of continual upgrades to the technology, our staff and the floors themselves! The original website was marketed under the name LED Party Floors and you can still see the legacy site here. 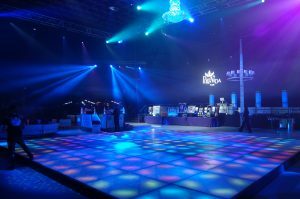 Our clients across the nation have continually been thrilled with our LED Dance Floors rentals and the technicians and operators that go out to their events. Moving into a new year with new products! As we have watched LED technology develop, we’ve been at the forefront to educate ourselves and our clients on the new uses of LED lighting in theatrical and event products. In the early days of In Depth Events, a natural offshoot of LED Dance Floors was to offer lighting systems and audio systems for our clients events. As LED technology expanded, we were able to offer UV rentals along with the floors and then, to include special effects rentals like ground fog, confetti and CO2 rentals. Now, we can offer our LED Dance Floors, as well as audio, lighting, staging, and special effects for all of our clients. For colleges, we offer All-Inclusive College Parties designed to provide an unforgettable night of dancing, special effects and EDM music for college students. Our offshoot for blacklight parties and special effects, Glow Party Experts, provides an immersive blacklight event for corporate groups and private events. Finally, we are one of the few companies in the United States with the capability of handling large scale UV in a touring environment for our 5K clients. Feel free to Ask Us a Question and trust that our event professionals will offer the services to fit your special event needs. Our experts are diverse, out-of-the-box event specialists that are here to provide the perfect event for your attendees. We look forward to hearing from you and working with you!